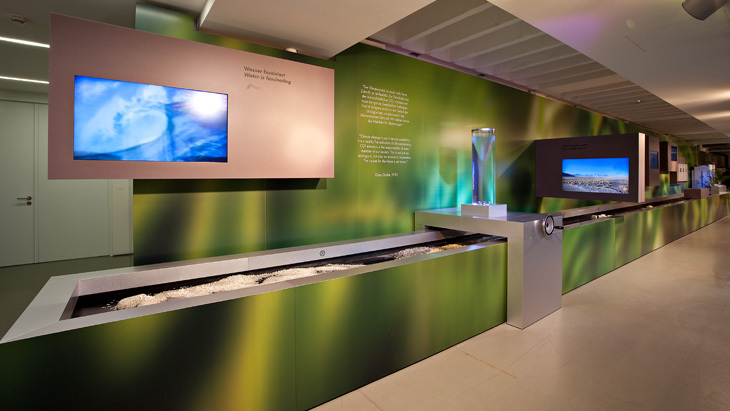 Sustainability can be great fun: An interactive waterway in the Hansgrohe Aquademie in Schiltach provides a visual demonstration of the importance of sustainably using the precious resource of water. At seven stations along the multimedia installation, children and adults alike can gain a real sense of fascination about water, view astounding water phenomena and expand their knowledge of water. Whether you create your own storm in a glass or calculate the saving potential of your household: the “green corner” in the Aquademie offers a great deal for you to learn about, be astounded at and get hands-on with. Water crises, water shortages, water contamination – how can we stop global emergencies that are related to water? Water saving calculator – where can you save water?